Need some narrative writing prompts that will surprise and interest your students. 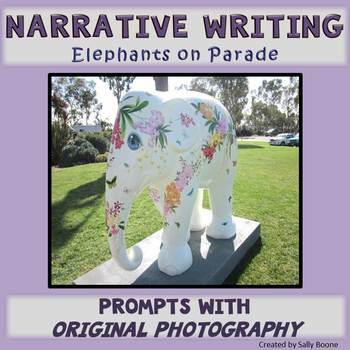 The prompts use photos from a trip to a town with a great artistic display of elephants. This packet includes a mini-posterfor display on a document camera. It briefly reviews narrative writing and gives directions for using the prompts. There are 7 individual prompt cards which may be copied and laminated for long time use. Please keep in mind that this is not for introductory use and assumes that students have had writing instruction and practice. Please see the preview above to see everything included! Check out this product with prompts for expository, narrative and persuasive. Be the first to know about my freebies, sales and new products! * Look for the green star next to my store logo and click it to become a follower. You will now receive email updates about this store. 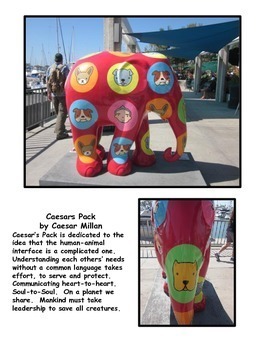 On a recent trip to Dana point, California, we found a parade of colorfully decorated life-sized baby elephant sculptures. Everywhere we looked, we saw elephants. Our love of storytelling took over. 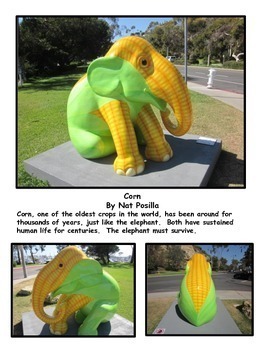 With each elephant, my husband and I came up with a new story about that elephant. And then I took photographs because I knew our students would love to see the elephants and love to write their own story. This city wide art exhibit wasn’t just an art display. 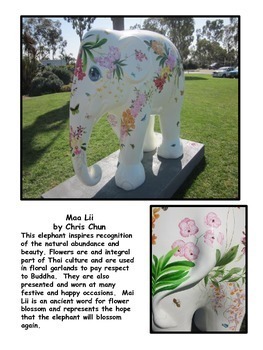 The elephants were painted to raise awareness and money to help The Asian Elephant Foundation. This foundation is an independent charity which supports projects in 13 Asian countries, The projects include educational awareness about the threats of extinction and research on behalf of the Asian elephants. Over the last one hundred years, reports indicate a 90% population decrease of the Asian elephant species. The elephant is Thailand’s national symbol, yet reports indicated there are only 2,00 elephants surviving in the wild. Scientists state that the Asian elephant population decreases by 3.5% annually so without proper action the species will likely become extinct in just a few decades.